Over-the-snow coaches transport you into the heart of Yellowstone National Park, where wolves might be seen trotting near ice-rimmed rivers, and frosty-faced bison linger near the warmth of the geysers. Ramble the boardwalks among steaming and bubbling hot pools, and if you’d like, your guide will teach you the fundamentals of snowshoeing or cross-country skiing. There’s something for everyone on this winter journey. Winter really is the coolest season! 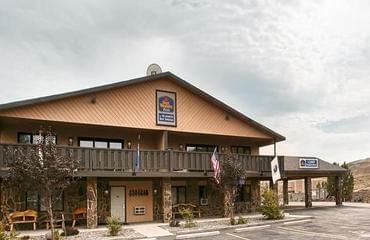 Gather in Bozeman, then travel over Bozeman Pass, through the Paradise Valley to Yellowstone National Park. 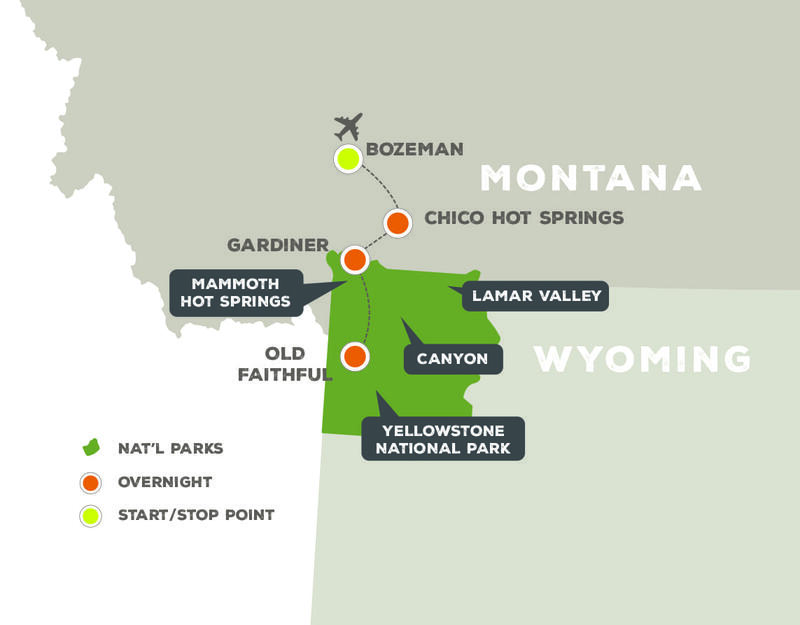 The first part of the trip is spent exploring the northern area of the park, highlighting the wildlife-rich Lamar Valley – oft referred to as the “American Serengeti” – and steamy Mammoth Hot Springs, with opportunities to snowshoe or ski on area trails. Each day is led by a sage guide, who is an expert in spotting wildlife. 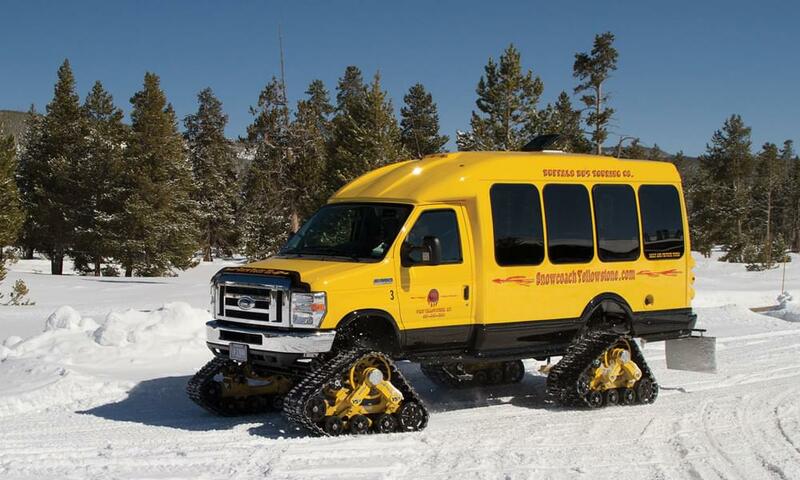 We’ll board an over-snow vehicle and relish a trip through Yellowstone only accessible to a lucky few in winter, taking in pristine winter scenes and always on the watch for wildlife. Barring a “bison jam,” we arrive at Old Faithful Snow Lodge with time to relax by the fireplace before dinner. Our days here are focused on active, fascinating geothermal features – colorful hot pools, steaming geysers, and bubbling mudpots. We spend our last night at a Montana classic – Chico Hot Springs – where a fabulous farewell dinner and soothing soak in the naturally-fed hot springs pools make the perfect ending. After breakfast the next morning, we’ll return to Bozeman for flights home. Wildlife watching: Winter is a fabulous time to see wildlife, and you have amazing opportunities to see elk, bison, otters, coyotes, and possibly the elusive wolves. Cross-country skiing and snowshoeing: Explore the snowy landscape with your guide on cross-country skis or snowshoes. No prior experience needed. Quiet season: See the park in its quiet splendor, with a limited number of visitors. Outdoors for up to 4 hours each day in winter temperatures at elevations ranging from 5,000 to 7,500 feet. Daily walking on boardwalks and pathways in snowy and possibly slippery conditions. 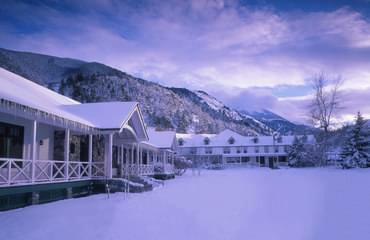 Activities include walks of up to 1.5 miles, optional cross-country skiing and snowshoeing. Travel south along the Yellowstone River through breathtaking mountain scenery to Mammoth, at Yellowstone’s north entrance. Explore the steaming limestone terraces of Mammoth Hot Springs, and photograph elk as they wander along the terraces and among the buildings. Try walking in snowshoes to explore the Upper Terrace on a short trek through trees and around giant boulders to steamy hot springs. Today is all about wildlife. We’re in the Lamar Valley by sunrise to scan the hillsides for secretive gray wolves. The wildlife viewing is incredible, with vast herds of bison and elk, coyotes, bighorn sheep, and eagles all calling this valley home in the winter. Knowledgeable naturalists explain the wolf reintroduction story, and teach you how to identify different types of tracks. 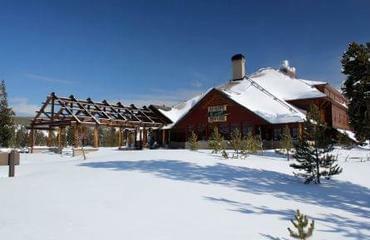 Enjoy a hot lunch in the small mountain town of Cooke City and return to Mammoth by late afternoon. Board a special over-the-snow vehicle and take the scenic route to the Old Faithful Snow Lodge, sharing the road with wandering bison. Stop to peer into the Grand Canyon of the Yellowstone to see the incredible sight of the massive, iced-over falls, then continue on, watching for the great herds of elk, playful otters, and other wildlife of the Hayden Valley and Yellowstone Lake area. Upon arrival at the Old Faithful Snow Lodge, settle into your room then walk out to catch the eruption, which is far more dramatic in winter, when the hot water hits the cold air. The Upper Geyser Basin contains the largest concentration of geysers on earth. On your walking exploration, along with Old Faithful you’ll see Grand Geyser, the largest regularly erupting geyser in the world! See the striking colors of Morning Glory Pool, watch mud pots bubble, and learn how this amazing network of thermal features was formed. Walking through this landscape of active geysers and hissing fumaroles pouring steam into the clean, cold air is an otherworldly experience. After a hot lunch, you can rent snowshoes or cross-country skis if you'd like and head back out with your guide to continue exploring the forested trails. There are great active and non-active options for everyone, including the kids, this afternoon. Catch the snow coach back to Mammoth, stopping to walk the trails at Fountain Paint Pots to see the bubbling mud and other unusual features. Arrive in Mammoth by early afternoon and travel north through the spectacular Paradise Valley to Chico Hot Springs, where you can enjoy a soak in the hot pool before your festive farewell dinner. Start the day with Chico’s generous breakfast buffet and then return to Bozeman for flights home.